The joke is that the owner, who had been living on the property for ten years, just wanted a walk-in pantry and heated floors when he approached KAA Design Group in 2006. 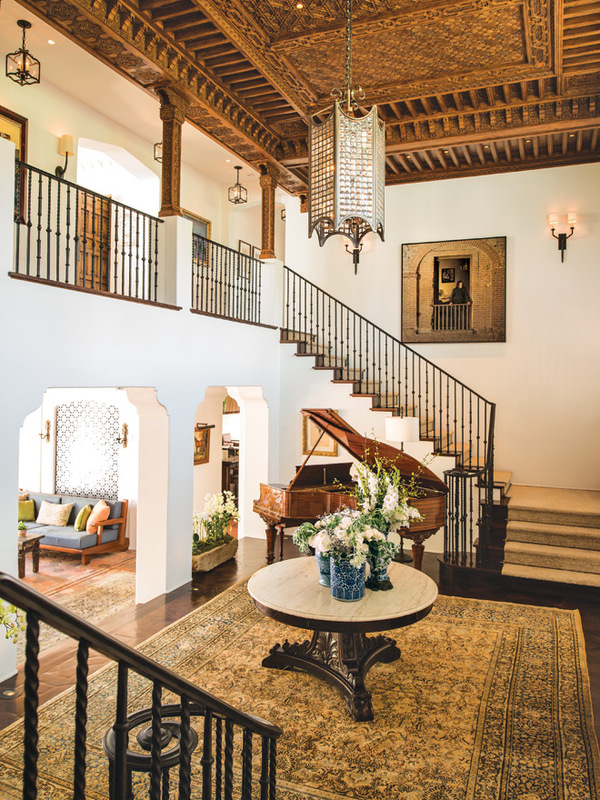 Four years later, and capitalizing on the acquisition of the neighboring lot, he had an Andalusian-style retreat that evokes the great Spanish revival estates of 1920s L.A.
Artisans from the Moroccan company Arabesque, which has been in the same family for more than 750 years, were key in the execution of decorative elements. Flown in from North Africa, they carved by hand the ornate ceiling and columns of Lebanese cedar in the two-story foyer and the stunning plasterwork in the dining room. Arabesque also supplied the tiles used on walls and stairs as well as for the Alhambra-esque fountain and water rill that flows into a poolside basin. 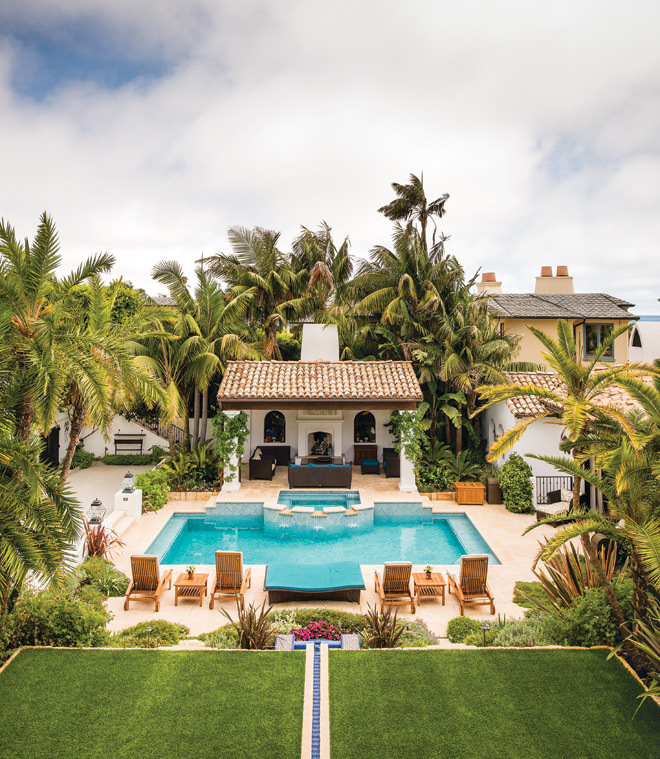 For a painted wood ceiling in the outdoor living room, however, Tran turned to local artist Scarlett Jackson, whose work would look at home in Seville. The house isn’t without modern touches. The top of a stone bench in the garden, part of a secluded outdoor dining space with a quaint coved fireplace, lifts so that the TV stored inside can be raised for viewing. An even larger TV drops down from the roof of the cabana, which has its own fireplace. The flowers on the balconies are watered by an irrigation system built into the ironwork. Inside the house, lights, air-conditioning vents, and audio speakers are concealed within the carved ceilings. Moorish ventilation grilles were custom made out of aluminum, then painted white. “The house allows for a contemporary lifestyle but stays true to its roots,” says Kirkpatrick. 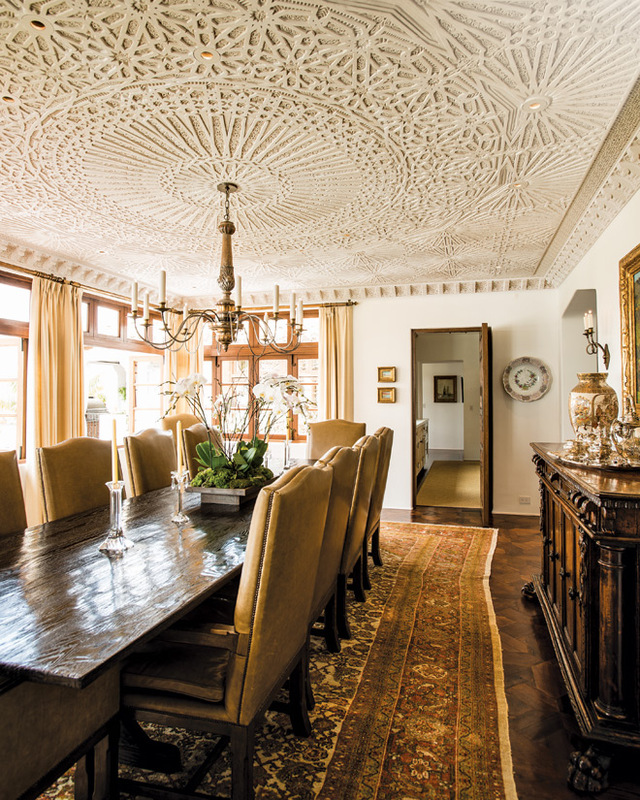 The motif for the dining room ceiling was created by Moroccan artisans. 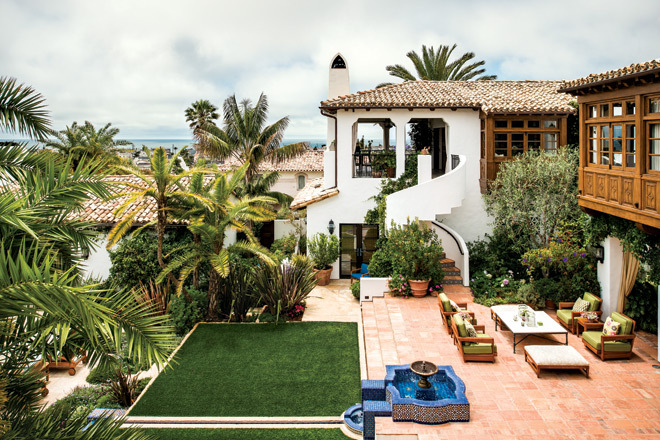 A second-story terrace next to the kitchen offers the most expansive ocean views. The roof is composed of reclaimed tiles, mostly from Italy. Architects Duan Tran and Grant Kirkpatrick stand by the front entry. To the left of the pool and cabana are boccie and basketball courts; to the right is a guesthouse, completing the enclosure of the garden on all sides. 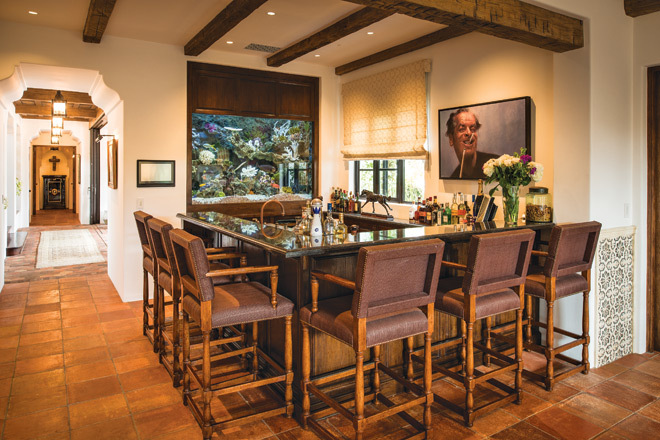 A bar area has a painting of Jack Nicholson by German artist Sebastian Krüger. While not typical of a Spanish home, the saltwater aquarium was a must; the owner has had one in each place he’s owned. The chest at the end of the hallway is a humidor for his cigar collection. The two-story foyer leads to an outdoor living room that looks onto the courtyard garden. To the right of the downstairs hallway is an entertainment area that includes a billiard room and movie theater. 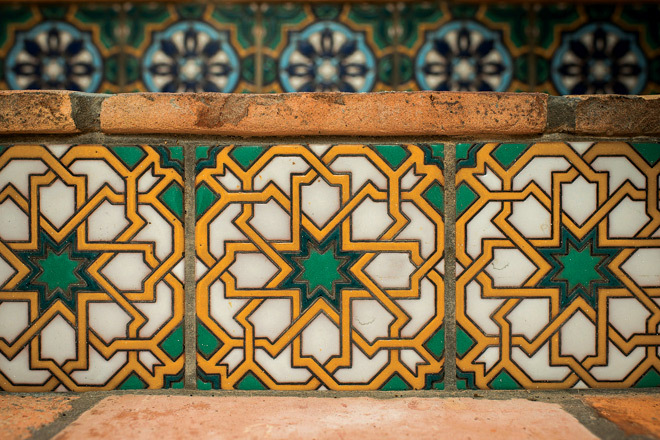 In keeping with the Moorish design, the architects imported the outdoor stair tiles from North Africa.